Judging by the plethora of fake rowing memorabilia on sale on sites such as eBay, it would seem like all of those fragments of the True Cross have been turned into rowing oars, and other items designed to dupe the gullible and ill-advised. 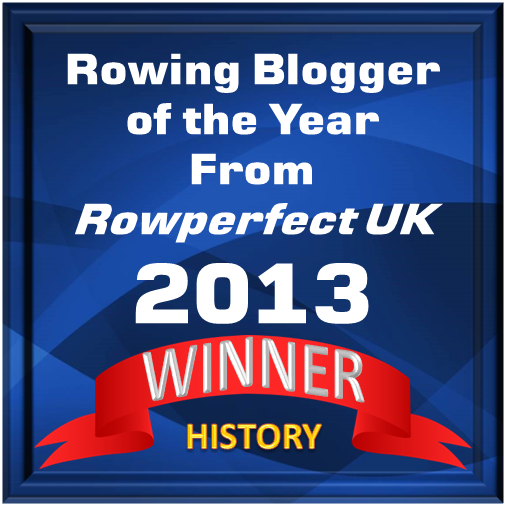 One item that came to the attention of this correspondent recently was perhaps the worst rowing fake ever produced. 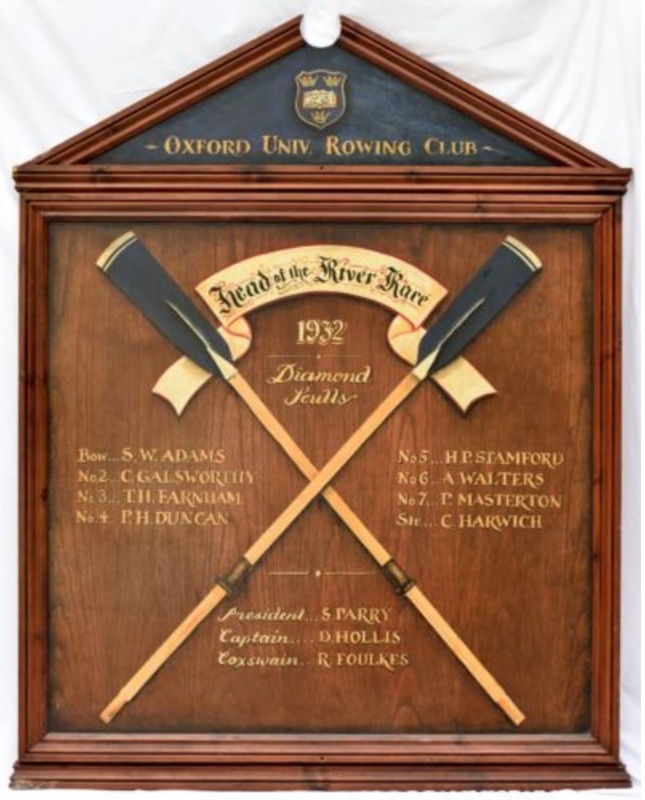 Offered for sale by an art dealer in Florida is an honour board purporting to be a genuine piece of Oxford University rowing history from 1932. As fakes go, it could hardly be more ham fisted. About the only thing that looks right with this is the university coat of arms at the top. From there it is a litany of errors. To start with, they get the name wrong, and instead of attributing it to the Oxford University Boat Club, the name used is the Oxford University Rowing Club. The board also claims to honour a crew that rowed in the Head of the River Race, but of course the Oxford Blue Boat competes against Cambridge in the Boat Race, which is a completely different thing. None of the names for the crew correspond to the members of the actual 1932 Blue Boat, and as far as can be ascertained, none of them was even at the university. That did not stop the forgers throwing in a President and a Captain, neither of whom was in the crew. Their names are duly inscribed below the crossed oars with their glorious, and entirely incorrect, yellow trim on the dark blue spoons. All this is for the taking for the princely sum of US$1,500! Perhaps, the most delicious detail of this fake is that the crew somehow won the Diamond Sculls as they were racing the in the Head of the River Race. I suppose it would be hard for even the most prodigious sculler to compete with an eight, but what would Henley’s venerable Stewards have to say? How could such an obvious fake make its way past their eagle eyes? A quick Wikipedia check of the crew names would have revealed this article’s provenance undoubtedly lay in the Eighth Circle of Hell. Elsewhere on eBay there are “authentic” Oxford varsity rowing oars painted white with red tips, which fall well short in length of the 12 ft or so one would expect for a sweep oar. Oxford is not the only attribution given to fakes. 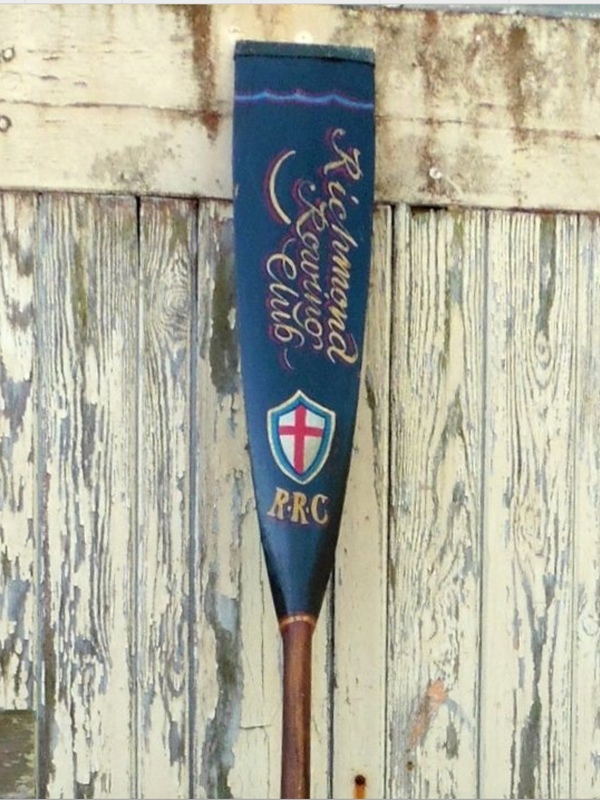 HTBS’s redoubtable Tim Koch found a “Richmond Rowing Club Trophy Sculling Oar” on eBay coming from an entirely fictional rowing club (on the right). That didn’t stop them asking £420 for the fake. The fakes don’t end with oars. 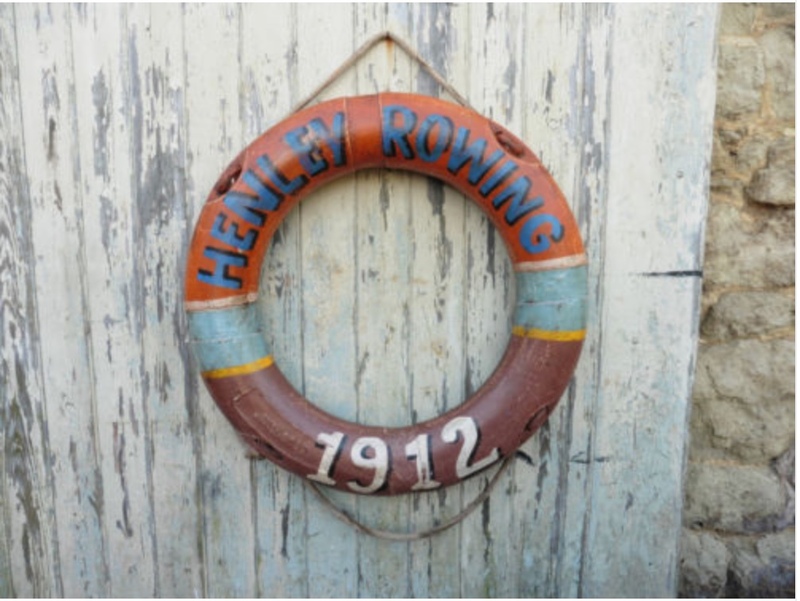 The same vendor offered a life preserver emblazoned with the words “Henley Rowing 1912”. eBay seems either unwilling or incapable of reining in the sale of fake rowing memorabilia, or indeed fake memorabilia of any sort. Should we worry, or merely say that this is a case of caveat emptor? As a genuine collector of items of rowing history, should I even be pleased that such things are on the market, as it creates less competition for those items that are genuine and significant? The counter argument is that the sport of rowing as a whole is diminished when people who might like to support it, however vaguely, are defrauded by forgeries such as these. As people who truly love the sport of rowing, we also have a duty to protect these buyers from unscrupulous sellers who would exploit them. 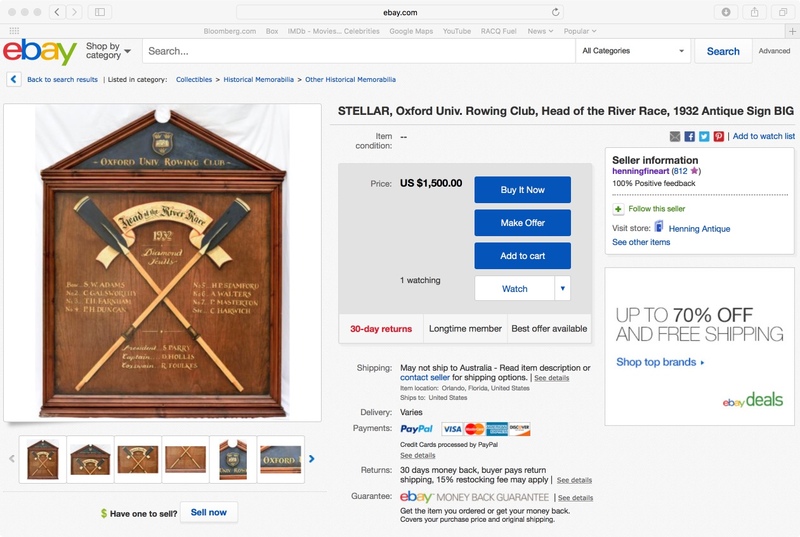 And just as the art world is undermined whenever a fake painting masterpiece changes hands, so too the history of our sport is reduced when fake rowing memorabilia is sold. I agree about the challenge of fakes for sale but it is fun in verifying the authenticity of items and often you will learn lots of new facts. I’m sure he spends a lot of time pulling his oar…. The seller on eBay clearly states that the sign is a decorative reproduction and not sold as anything more. He clearly states it would look good decorating a bar wall etc. it’s sad to see you waste your time trying to negatively affect their business when they clearly do a good job with 100% feedback. REPRODUCTION items are created so that individuals who love the history but are unable to afford the originals can own and cherish that part of history. Even museums sell poster reproductions and other items etc… so you can take a piece home with yourself. You attacking this first eBay seller seems out of line and rediculous. Just because it doesn’t make you happy it’s for sale their not trying to fool anyone. This was a weak pull for you to see you including it and clearly LYING about it in this write up. Sad to see.. This isn’t a ‘reproduction’ though. The details are totally bogus. I’ll happily paint you a proper reproduction of any crew for any event, and if we are lucky, on a period correct oar as well. Did you ever look Down-Under for those supposedly non-existent clubs? The article writer lives Down Under. He knows if a club like this would exist – it doesn’t.